If you do not like what I am writing you can decide to boycott me. I hope you won’t take such drastic action and please, whatever you do, don’t lynch me. I am sure you have heard the words boycott and lynch and no, they were not the opening batsmen for Yorkshire. Captain Charles Boycott was an unpopular landowner in Ireland and Charles Lynch was a cruel Virginian magistrate who often went beyond what the law allowed and both of them have entered the English language. I expect you can think of other words that have come from people’s names and the same is true of places, whether it is the popular racquet game first played at Badminton in Gloucester-shire or the warm headgear first worn outside Balaclava in the Crimea. The technical term for these words is eponym, from a Greek word meaning “named from” and whether you knew the word or not no doubt you can think of other examples. Here is another eponym. 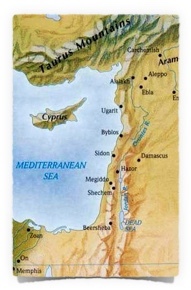 Our word Bible comes from a place: the ancient city of Biblos – sometimes spelled Byblos – in Phoenicia, which is today called Jbail and is twenty miles north of Beirut in Lebanon. The Phoenicians were well known as seafarers. In 1 Kings 9, for example, Solomon entered into a trading partnership with Hiram, the ruler of the Phoenician city of Tyre. Back before the Bible was written Byblos was a centre for the import and export of papyrus. The papyrus plant grows best along the River Nile in Egypt but Egyptian ships were not as seaworthy as those of the Phoenicians who were known to sail as far as Cornwall where they traded for tin. So merchants from Byblos bought Egyptian papyrus and sold it around the Mediterranean. Papyrus gives us our word paper but Byblos eventually gave the Greeks their word for book: biblion and today we borrow the biblio prefix for anything related to books. A book-lover is a bibliophile, for example, and a list of books is a bibliography. But what about The Bible? This reminds us of the days when The Bible was considered to be the book of books, in part because it is indeed a collection of sixty-six books from Genesis to Revelation but chiefly because of its pre-eminence as the written word of God. The Bible needs to be close to the heart of individual Christians and at the heart of the church for it is through the Bible that we meet God. Thus for many years Bible has been at the centre of the British Bible School and now, with this new magazine, we want to keep it there. 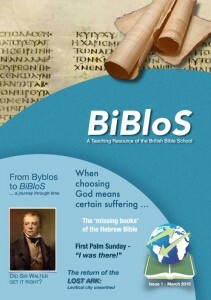 BiBloS looks back to the ancient Phoenician port where papyrus was sold and looks forward to the continuing ministry of the BBS in teaching others to teach the word (2 Timothy 2:2). We hope you will join us in this journey.